Though both NVIDIA and Qualcomm are compelling tech stocks to buy, we examine which is the better buy through a three-part analysis. As the next era of computing unfolds in front of us, today's largest semiconductor companies are working tirelessly to position themselves to benefit from big-ticket trends like the Internet of Things, self-driving cars, artificial intelligence, and more (tech buzzwords unite!). 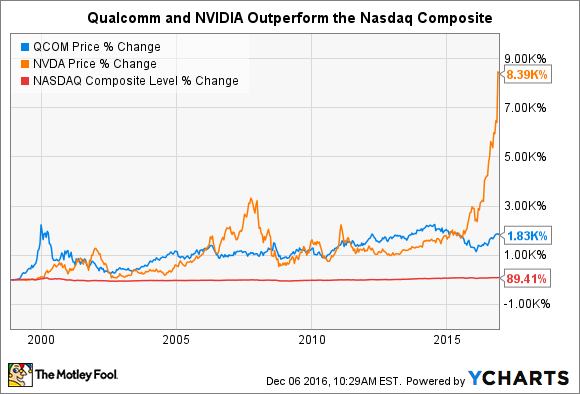 Perhaps no two companies exemplify this trend better than longtime semiconductor powers Qualcomm (NASDAQ:QCOM) and NVIDIA (NASDAQ:NVDA), whose shares have each utterly trounced the Nasdaq Composite since the days of the dot-com bubble. But which semiconductor stalwart is the better buy today? To determine this, we'll run Qualcomm's and NVIDIA's stock through a three-part gauntlet to see if one is more deserving of investors' attention. Both Qualcomm and NVIDIA are highly successful companies, so it should come as no surprise that each enjoys a firm financial foundation on which to base its future growth. Here's a quick breakdown of a few of the most common balance sheet and liquidity measures I look at when conducting similar analyses. Data source: Yahoo Finance, Qualcomm investor relations, NVIDIA investor relations. While it's tempting to conclude that Qualcomm easily wins this test of financial prowess, the reality is more complex for one important reason. This October, Qualcomm agreed to buy NXP Semiconductor (NASDAQ:NXPI) in a $47 billion all-cash transaction. Qualcomm plans to finance the NXP Semiconductor acquisition -- expected to close by the end of 2017 -- through a yet-unspecified mix of cash on hand and newly issued debt. Though Qualcomm remains committed to maintaining its investment-grade credit rating as part of the merger, this shrewd transaction will nonetheless dramatically alter Qualcomm's balance sheet in the near and medium term. Briefly turning to NVIDIA, the graphics chip specialist has no such looming obligations to alter its financial fortitude. The bulk of NVIDIA's growth in the coming years should be organic (see below). At the end of the day, contrasting Qualcomm's cash generation dominance -- despite the NXP merger -- with NVIDIA's clearer near-term outlook makes for an even tie for these two chip stocks. In short, both Qualcomm and NVIDIA are incredible companies, and both enjoy meaningful competitive advantages in their respective areas of the semiconductor market. Having played a pioneering role in its development, Qualcomm dominates cellular connectivity in one form or another. Its Snapdragon mobile processors consistently rank among the best SOCs powering smartphones and other mobile devices, and its chip segment produces the bulk of its revenues each year. However, as a result of its role in actually creating the cellular technologies we know and love, Qualcomm owns a war chest of patents that allow it to collect royalties on every new 3G or 4G device that's activated. This patent-licensing business is disgustingly high margin and produces the majority of Qualcomm's pre-tax earnings, though Qualcomm's patent operations have notably encountered and overcome some meaningful headwinds in recent years. The addition of NXP Semiconductor will only expose Qualcomm to an entirely new segment of growth markets in the Internet of Things. It's hard not to like Qualcomm's general business outlook. That being said, NVIDIA's growth outlook trumps that of Qualcomm. Almost by accident, NVIDIA's deep specialization in graphics processors, more commonly known as GPUs, places the chipmaker at the forefront of some of tech's most prominent growth markets. Though it may not seem apparent at first, next-gen technologies like self-driving cars, artificial intelligence, virtual reality, and other new-age industries all rely on image processing to function. And while Intel and Advanced Micro Devices each make their own graphics chips, NVIDIA's chips are the standard by which all other GPUs are judged. As such, the company is fast at work expanding headlong into these aforementioned growth markets. So while I strongly admire Qualcomm's business model, NVIDIA's place at the middle of a few important growth markets gives it an edge over Qualcomm. So with both companies' competitive dynamics in mind, let's turn our eye to their valuations. Crucially, understanding whether a stock is undervalued or overvalued is a matter of context. A company with an astronomical P/E ratio can, in theory, be undervalued if its growth outlook matches or exceeds its pricing. Keeping that in mind, here is a brief overview of some common valuation metrics for Qualcomm and NVIDIA. Obviously, there's a huge gap between the way the market values Qualcomm and NVIDIA. However, given the differences in their growth outlooks as discussed above, the real question should be this: Is one more favorably priced than the other? Oddly enough, it turns out that their valuations might have more in common than first glance suggests. The average sell-side analyst expects Qualcomm will grow its EPS at a compound average growth rate (CAGR) of 10.5% each year for the next five years. That same estimate for NVIDIA is 28.5%. To reconcile those differences, investors can turn to the PEG ratio. Interestingly enough, Qualcomm and NVIDIA actually have nearly identical PEG ratios. Qualcomm's PEG ratio is 1.3 times, and NVIDIA's PEG ratio falls just a hair lower at 1.2 times. A 1-times PEG ratio is fairly valued in theory, though this ratio, in general, isn't my favorite. To be clear, both Qualcomm and NVIDIA are tremendous tech stocks. Qualcomm's powerful legacy model combined with NXP Semiconductor will only strengthen this top semiconductor name. At the same time though, NVIDIA's growth story simply seems too massive to ignore. So while you can't go wrong buying either stock, NVIDIA shares are the better buy in my estimation today.